My name is Ian Helm. 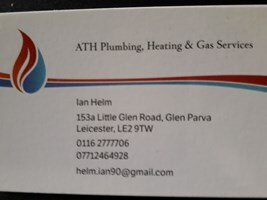 I am a sole trader and I have been doing general plumbing for 6 years and I have been a qualified Gas Safe Registered Engineer since 28 May 2018. I provide general plumbing and gas services. For Plumbing I do jobs ranging from changing leaks on taps/tap washers to full bathroom installs includingn Showers. For Gas I do Gas Boiler services, Gas fire Installs and Servicing and Gas Cooker/Hob installs and Services. I can also carry Legionella Risk Assessments.